Inflatable water slides for rent have brought a lot of joy and happiness to both, kids and parents. They are perfect for special occasions like birthday parties and work out days, but here is the thing, are inflatable water slides only for children? Of course not, adults can also enjoy a good water splash once in a while. They are also ideal for adults birthday parties too as they can constitute the main activity in the celebration! These inflatable water slides for adults are not cheap to obtain, as they are usually very big. So if you would like to have a few hours of fun and bring back some childhood memories, we strongly suggest you to get in touch with your favorite party rental Miami. They surely will have something of your interest. We will start with Nicky Party Rentals own new 24 FT water slide ready to rent today for all adults young at heart at only $299 for the day. This one is a blast! The triple fun Slide N’ Jump inflatable amusement game features three activities (climbing, jumping and sliding) so you can choose your own adventure! In this inflatable you can start off by climbing the blue stairs to the first platform and then you can jump to the green air bag, in there you will have to options go below or climb higher. When climbing higher you will find more steps to get to the top of the platform where you will be able to slide from a gigantic blue slide until you get to the last zone! The triple fun Slide N’ Jump inflatable has a soft air bad system that will prevent you from getting hurt! This toy can hold up to 1200 pounds, so this activity can definitely be done in groups! Are you ready for adventure? Are you ready for hot summer days? Bring the cool to your summer with the 25 Foot Super Splash Down Inflatable Tropical Water Slide. You can rent this baby from your favorite rental company, you won’t regret it! This tropical water slide decorated with palm trees, has an 8.3m height, which creates a high speed for the rider when splash into the water pool, a very extreme water fun for bold adults! Its design includes double lane, single lane, triple lane, multi-lane if you are feeling extra adventurous. You can set it up at your backyard, at the beach or even at a pool! This wave shaped water slide is a really cool item for any party! You and your guests will find very s thrilling to slide down from a high slide and getting splashed into the water pool. If you have been to a water park before, you can definitely get the picture! And as it has a dual lane, it will allow two people go at the same time, which can make room for a little competition. Dual Lane Slip n Slide Inflatable Wave Water Slide can be installed at your backyard, a pool or at the beach. Get your slide and cool off! This toy will bring you and friends hours of joy and water splashes. You will first climb the small stairs until you get to the slide, where you will be able to slide through 20 feet! An excitement feeling in your tummy is the best way is can describe the experience! This Giant Inflatable Tropical Dual Water Slide is suitable for outdoor, family and playing center uses. Its material is made out of nontoxic PVC and its design makes it very safe. Races can’t get any more fun! 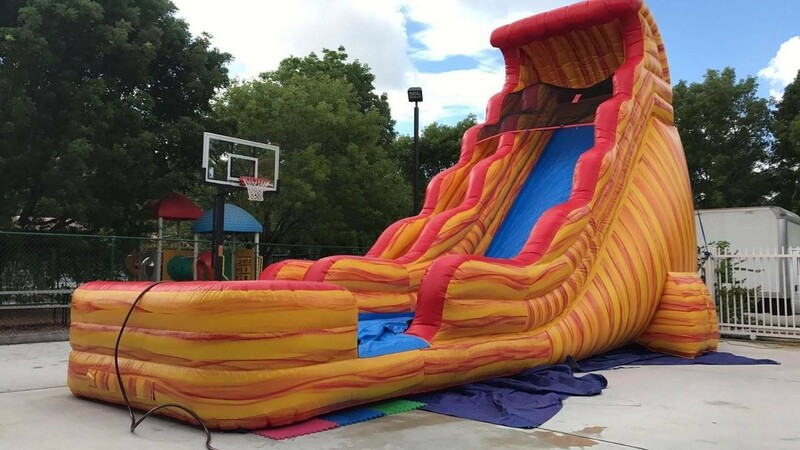 With this top rated inflatable water slide both adults and kids will be able to race through its 16 foot long lane while getting their feet and body splashed by water. Banzai Triple Racer Water Slide has three competing lanes, this means that three children can race at one time! It is. You can find this item at any toy store for around $20 to 25 dollars. You can easily set this beauty up in your backyard, just make sure you have plenty of space before getting it! Now, if you have a pool, you can just make twist to it and have some competition games started, by racing friends at the pool!